Has been co-opted a member of the Atherton and Tyldesley Local Education Sub-Committee on his retirement after 24 years' service as school attendance officer, which event the teachers of the Tyldesley schools, together with the District Council officials, have celebrated by the presentation to him of a gold watch. Mr. Tyldesley was one of the founders in 1876 of the Tyldesley club, and for 31 years has taken an active part in its management. The club is one of the oldest in Lancashire. Ralph Tyldesley has many descendants in England, Canada and the USA, and was the father of Addin Tyldesley 1877-1962 who represented Great Britain as a swimmer in the 1908 Olympic Games in London. 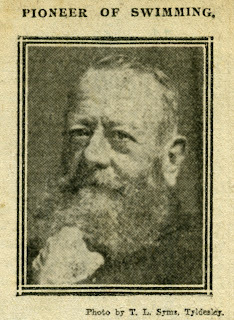 A report of Ralph Tyldesley's death in 1913 appears in a later post.